A superb example of a serpentine fronted walnut commode with original locks, handles, and escutcheons, wonderful warm colour and really good original condition, with no loses or breaks to the legs or cracks to the sides. 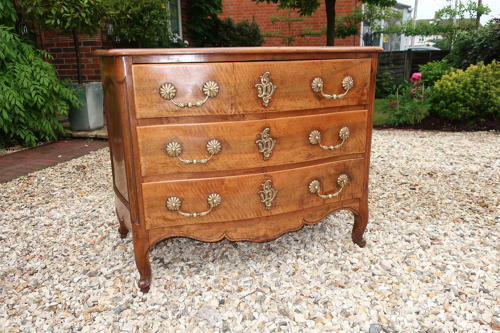 smaller than average, with fielded panels to the sides, all three drawers run well, this commode has simply been cleaned and waxed, needing nothing else. Dating to the mid 18th Century.